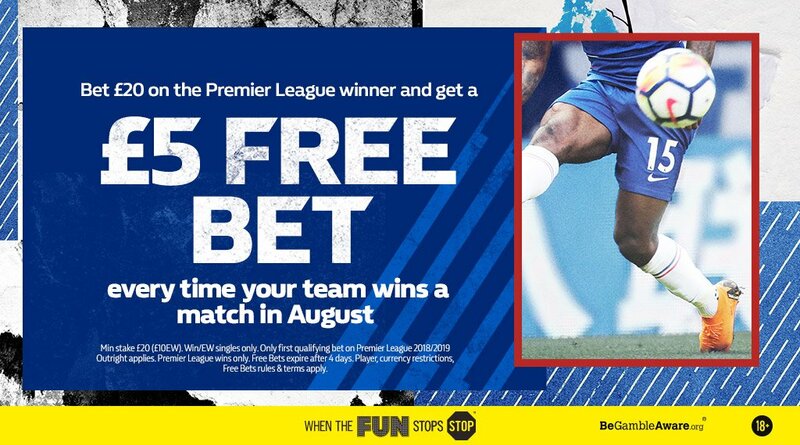 William Hill are offering a £5 free bet every time your team wins a match in August. All you have to do is place a £20 / £10 each way bet on the 2018/19 Premier League outright market. You have to bet a total of £20/£10 each way on the Premier League 2018/2019 outright market, and receive a £5 or currency equivalent free bet every time your team wins a Premier League match this month. Looking for winning Premier League predictions? For every Premier League matchweek, we will share plenty of tips and predictions to help you maximise your betting profits. Find here our free Premier League predictions and betting tips selected by our range of football tipsters! "Get £5 Free Bet Every Time Your Team Wins in August with William Hill"